Yesterday I looked at defensive plays per game, trying to get a sense of whether teams created more fumbles purely because they had more opportunities to do so. They do not, but that’s because the difference in # of plays defensed is so small, on average. More interesting, though, is this chart. You’ll recognize it from yesterday, though I’ve re-labeled it “Offensive”. As mentioned, this clearly illustrates an uptrend in the # of plays run per game by NFL offenses over the past 10 seasons. The overall magnitude is small (see the Y-Axis labels), but the direction is unmistakable. Last season, teams ran about 1.5 more plays per game than they did in 2003. The difference is small enough that it could easily be the result of chance. However, if is was purely a result of natural variability, we’d be very unlikely to see such a smooth trend in the chart above. 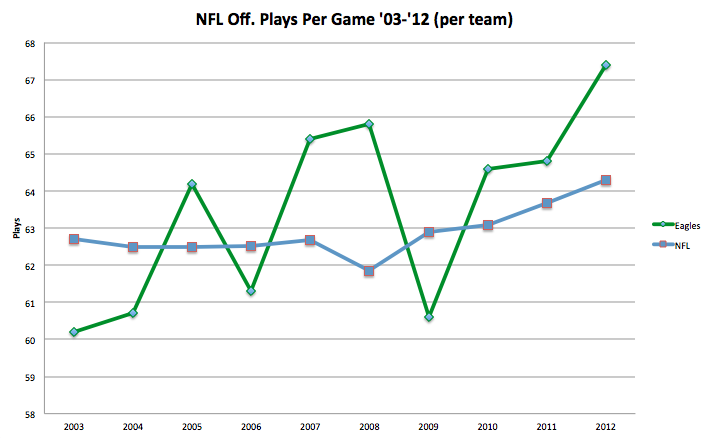 Aside from 2008, a distinct outlier, the annual increase in plays run per game has been both smooth and accelerating. Let’s take a look at the data in more detail, drilling down to the team level. As usual, I’ll start with the Eagles. Here is the same chart, with the Eagles annual plays per game illustrated. Last season, the Eagles ran more than 7 more offensive plays per game than they did during the 2003 season. 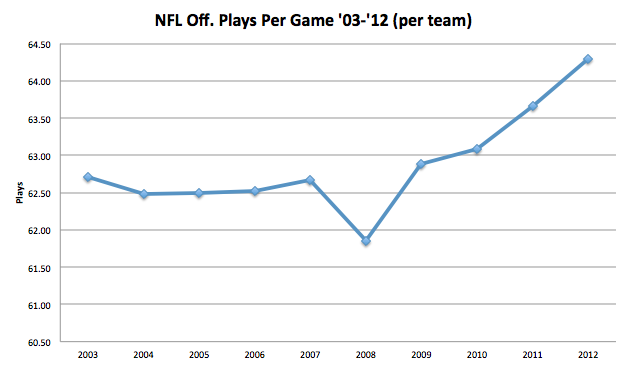 Again, the increase hasn’t been smooth (the team ran just 60.6 plays per game in 2009), but it’s real. Looking at the Eagles line in the chart above versus the League line also tells us that the team has a disproportionate influence on the league-wide uptrend. The Eagles began the subject time-period well below the league average and finished well above it. There are a number of potential explanations for this, but before we get to that, let’s look put the Eagles into context. 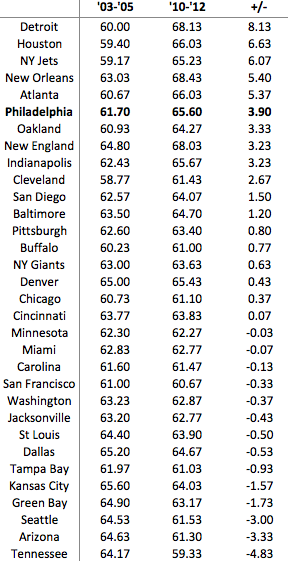 Here is a table showing the average plays per game run by each team from 2003-2012. There are a few obvious results (Patriots and Saints at the top, Buffalo and Cleveland at the bottom), but some surprises as well. St. Louis ranks 7th, for instance, which I certainly would not have guessed. However, the 10-year average isn’t really what we’re interested in, is it? We want to look at the relative increase. Here is another table, this one showing each team’s average over two time periods, ’03-’05 and ’10-’12. In other words, the first and last 3 seasons of the 10 year period. Also, I’ve included the change for each team (+/-) and ordered by that measure, so teams that saw the biggest increase in average plays run are at the top. This confirms what I asserted earlier, that the Eagles have had a disproportionate effect on the overall league trend. Just 5 teams have seen larger increases between the two time periods. I probably shouldn’t have taken this long to get to Chip Kelly, but better late than never. As we can see, the Eagles have already been towards the front of the league in terms of running higher numbers of plays. Whether this was an emphasis or not, it means that Chip Kelly’s overall effect on the # of plays run may be more muted than is expected. Given the finite amount of time in each game, the minimum required time for each play to be called and set up, and the fact that the other team get’s a roughly equal number of possessions, there is only so much that Chip can do to ensure the Eagles run more plays. Notice that New England, a team that clearly emphasizes speed of play, averaged just 2.43 more plays per game than the Eagles did over the past 3 seasons. Last season, the Patriots ran 74.3 plays per game, which I believe is the all-time record. Still, that was just 7 more per game than the Eagles. Why should we care about # of plays run? As explained in this article over at Philly Inferno, positive play differential is correlated with winning. Looking purely at offensive plays run per game, I get a correlation value of .30 (off. plays run – Wins). SImply put, more plays —-> more yards —-> more points. However, I want to emphasize something that isn’t getting a lot of attention. Emphasizing offensive pace is not enough to ensure you will run more plays. In order to run more plays, you need to keep the ball. In order to keep the ball, you need to convert on 3rd down. If the Eagles can’t convert 3rd down’s at a high rate, it doesn’t matter how fast Chip wants to play. Want to see the data? I thought so. 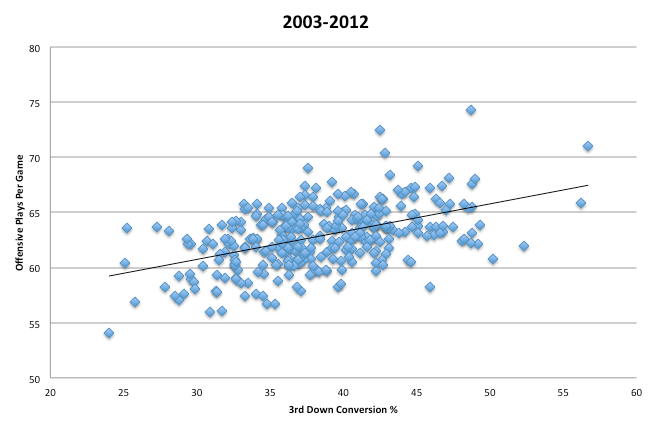 Here is a chart of offensive plays per game against 3rd down conversion %. Last season, the Eagles converted 37.4% of 3rd downs. If the team can’t improve on that measure (significantly), it won’t matter how badly Chip wants to run more plays.